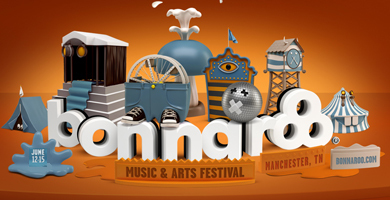 Elton John, Kanye West, Lionel Richie, and Jack White are slated to headline the upcoming Bonnaroo 2014, slated for June 12-15 in Manchester, Tenn. The full lineup for the popular music festival was unveiled earlier Wednesday evening (Feb. 19) via YouTube. John, who recently released the album The Diving Board last September, will be headlining his first Bonnaroo. Meanwhile, White will return to Bonnaroo as one of the festival’s leading artists after performing as part of The White Stripes in 2007. West will return after he received an unwelcome reception from concertgoers at the festival in 2008, when the entertainer took the stage hours behind schedule. Richie made a surprise appearance with Kenny Rogers in 2012. More than 125 artists will perform, including The Avett Brothers, Sarah Jarosz, Blackberry Smoke, Shovels and Rope, Carolina Chocolate Drops and numerous others. Tickets go on sale Saturday, Feb. 22 at noon through the festival’s official website.